What the heck is "Inspection Maintenance"? Well, vehicle manufacturers have established, through various means, the mean time between failure for fluids and many so called "hard parts" on you vehicle. However there are some things they just cannot predict as it may depend on where the vehicle is domiciled, who is driving the vehicle, and any aftermarket items the owner may have installed on the vehicle. For this they have set up inspection intervals. If everything looks okay, check it again at the next service. These items vary by manufacturer but they may include brakes, shocks and struts, drive belts, wiper blades, hoses, and, well you get the picture. How does one keep track of what has been inspected and what hasn't? Sierra Service Center uses a unique digital vehicle inspection (DVI) system by Bolt on Technology. Our technicians have a paperless electronic inspection system which, once completed can be sent directly to our clients email including pictures of problems, and voice to text translations which allow the customer to read the the technician's own words a discription of a problem which may not be available by photograph. Based on the inspection results, repairs or maintenance services may be recommended. In many cases this information can be given to the client while the vehicle is still on the rack and they can make a decision to go ahead with the services to save time and a follow up visit. How often do we perform Inspection Maintenance? Every Oil Change! A detailed electronic technical inspection of your vehicle including photos and direct comments from the technician performing the inspection. 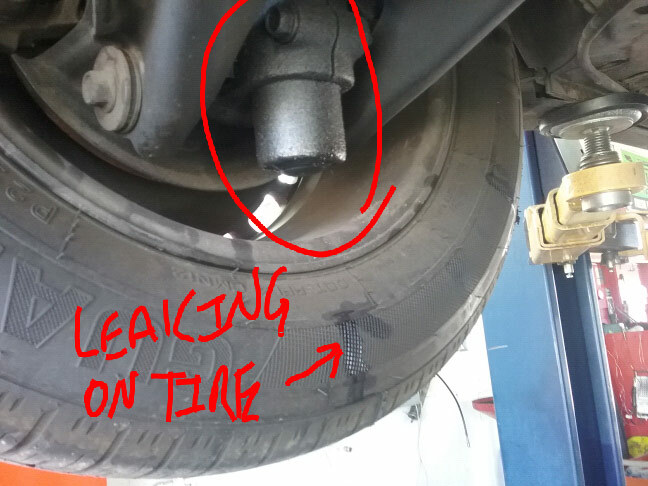 DVI image showing strut leaking fluid on tire. 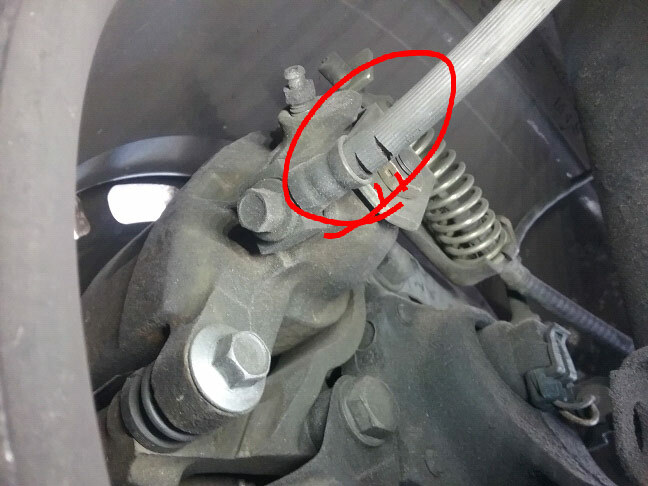 DVI Image showing cracking brake line.